There have been so many performances this season of The Rite of Spring (AKA Le sacre du printemps in the original français) in celebration of the work’s centenary that some people have expressed concerns that the work was becoming over-exposed. You wouldn’t have known it by the number of seats filled Tuesday night at the Hollywood Bowl — well over 9,000 people, large for a mid-week classical concert — and the enthusiasm shown by the audience. Sacre still sells, even at the Bowl. Those in attendance were treated to a rendition of Stravinsky’s groundbreaking ballet score quite unlike any played by the Los Angeles Philharmonic in over two decades, care of conductor Rafael Frühbeck de Burgos. During Esa-Pekka Salonen’s 17-year tenure as Music Director, the orchestra played the work on an almost annual basis. His approach certainly evolved during that time, but there were more commonalities than differences through the years: a crystalline transparency, laser-like precision, and an almost industrial churn that still managed to revel in the work’s frequent, if fleeting, beauty. 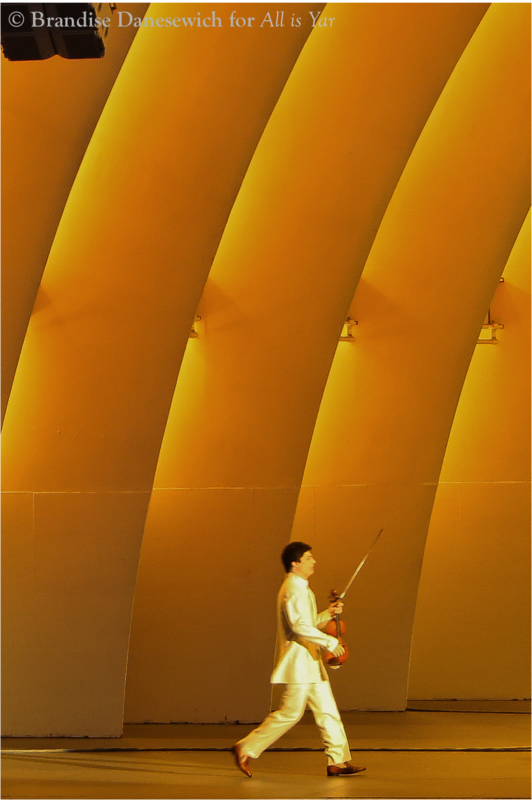 Gustavo Dudamel’s version from the beginning of the 2012/2013 season was more of the same, the LA Phil’s current Music Director seeming to build upon his predecessor’s interpretation — the one the orchestra seemed to have internalized — rather than try to dismantle it. Sure, he did some things differently, but this was certainly more evolution than revolution. 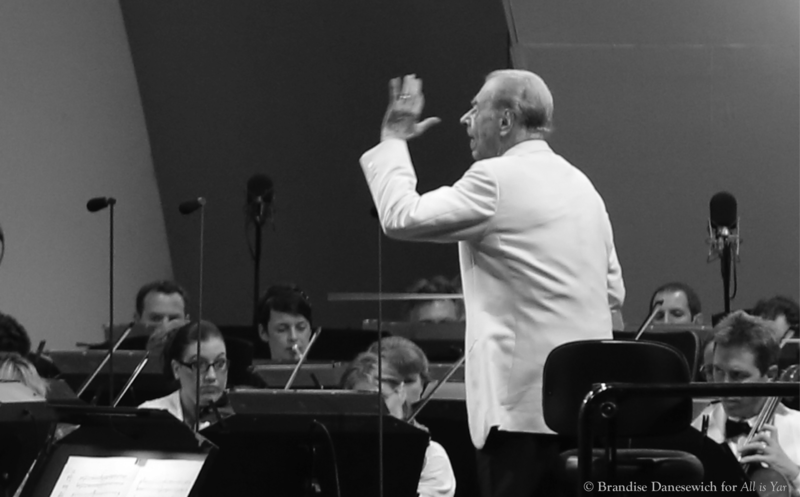 If memory serves, the only time during that same period that the orchestra performed The Rite of Spring under the baton of someone other than a Music Director was when Zubin Mehta led performances with the orchestra in 2001, a few years before Walt Disney Concert Hall opened. I remember that version being sleek — almost to the point of being slick, with all the sharp angles and rough edges smoothed over. Mr. Frühbeck’s take was completely different: usually more raw, sometimes more restrained, altogether more primitive. He tweaked the way this orchestra plays The Rite, especially in the tempos he chose and the harmonies and orchestral colors he emphasized. He conducted without a score, he knew what he wanted, he made sure to ask for it. Frequent readers of All is Yar will know that the Spanish maestro is one of the LA Phil’s favorite guest conductors, and the relationship clearly paid dividends on this night. The orchestra responded to him impressively, especially considering the extremely limited rehearsal time afforded to them during the summer. No matter how often an orchestra performs it, The Rite of Spring is not a work one can play on autopilot. A merely cohesive performance would have been understandable. The thoroughly compelling performance they gave instead is as much a testament to the orchestra’s flexibility and virtuosity as it is to Mr. Frühbeck’s musical vision. Notable individual contributions were numerous, but a few deserve extra attention. Whitney Crockett’s opening bassoon solo was airy and haunting. It was good having Carolyn Hove back from her year-long sabbatical to play the prominent English horn part. Frequent guest Larry Kaplan did an admirable job on alto flute. A chorus of crickets added to the atmosphere. An occasional helicopter detracted from it (how do they always know to fly by during the most quiet moments?). The big work in the first half of the evening was Tchaikovsky’s violin concerto. Augustin Hadelich was the featured soloist, dressed in a high-collared white jacket and matching trousers that made him look a bit like a naval officer. While many violinists of his generation use the work as an opportunity to play with edginess or wild abandon, the young German/Italian was the epitome of control, refinement, and musicality. Sure, he offered plenty of bravura moments and displayed gobs of technical wizardry when called for in the score, but not at the expense of beauty or precision, and never just to show off. Think Audi R8, not Lamborghini Gallardo. More like Eric Ripert’s cooking, less like Marcel Vigneron’s. The response was overwhelming. The violinist may not have gone crazy, but the crowd certainly did. He got a prolonged standing ovation after only the first movement, so much so that some in the audience were loudly asking their neighbors to sit down and let the man play the remaining two movements. Mr. Hadelich looked rather humbled and embarrassed by the over-eager attention he was given. After the inevitable eruption from the audience when the concerto was finally done, the violinist responded with a sterling rendition of Paganini’s Caprice No. 24 (perhaps better known to many as the main theme from Rachmaninoff’s Rhapsody on a Theme of Paganini). The concert opened with some light-hearted Stravinsky: the short orchestral work, Fireworks. It was a bright and colorful kick-start to the evening. Burt Hara, the orchestra’s distinguished new Associate Principal Clarinet, played first chair for the whole evening. Though his name did not appear on the orchestra roster in the printed program, it does show up now on the LA Phil’s online roster. More importantly, he sounded great the whole evening, most notably during some exposed passages during the Tchaikovsky. We are very blessed to have him. One of Mr. Hara’s colleagues during his long stint with the Minnesota Orchestra, Principal Horn Michael Gast, played guest principal with the LA Phil during both Stravinsky works. Unfortunately, the cameras transmitting images of the musicians onto the big screen weren’t positioned in his favor, and the only times he was visible on camera was with his face obstructed. Maestro Frühbeck had a stool available for his use on the podium, but by my inexact measurement, he only used it about 40% of the time — more during the Tchaikovsky, less during The Rite of Spring, and not at all during Fireworks. 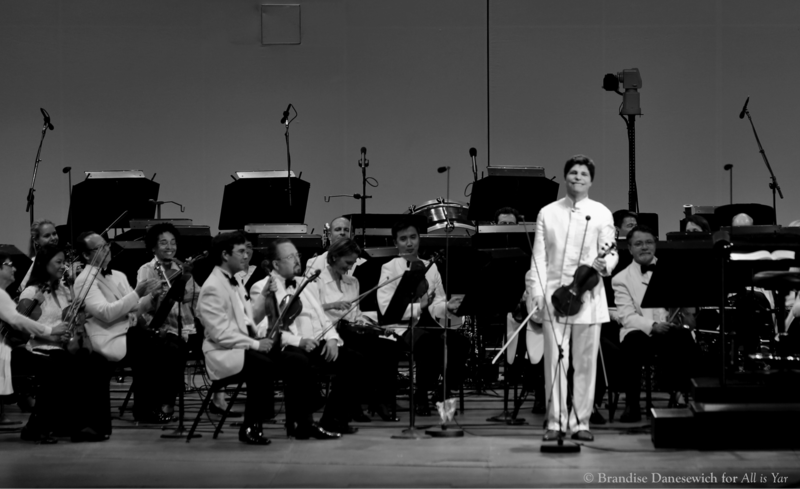 Tags: antimodel, Augustin Hadelich, Brandise Danesewich, Burt Hara, Hollywood Bowl, Michael Gast, Rafael Frühbeck de Burgos, Stravinsky, Tchaikovsky, Whitney Crockett. Bookmark the permalink.